Alexandrite is a variety of chrysoberyl with a distinct change of color when viewed in incandescent and fluorescent light. The colors that Alexandrite occurs in depends on its geographical source that has imparted minute chemical impurities into the pure chrysoberyl. Alexandrite was discovered in the Ural mountains of Russia in 1830 and named in honor of the Czar to be, Alexander II, who’s birthday it was discovered on. The finest Russian alexandrite changes color from red in incandescent to green in fluorescent lights further tying this stone to Russia emblemizing the countries colors. Some jewelry historians credit George F. Kunz, Tiffany’s influential gemologist of the late 19th and early 20th centuries, for popularizing the stone. He made several trips to Russia in search of fine stones. Although few alexandrites have been found in Russia in the last 100 years, the quality of the original Russian Alexandrite has set the standard for which all other alexandrite is judged. The finest Russian material is neither the red of a ruby nor the green of an emerald but a distinctive raspberry red and teal green color is obvious. Because of the rarity of old Russian material you are more likely to see fine Brazilian material today. Brazilian alexandrite exhibits a color change from a lively bluish-green to a bright purplish red. Alexandrite is mined in Russia, Brazil, Burma, Sri Lanka, Madagascar, Tanzania and Rhodesia. There are a small number of talismanic stones which have gained their reputation in our time. Alexandrite is one. It is a variety of chrysoberyl that was found in Russia, associated with the emerald mines on the Takowaya, in the Ural region. The discovery of alexandrite is claimed to have been made in 1831, on the very day Alexander II (the heir-apparent) reached adulthood. It was named alexandrite, in his honor, by Nordenskjold, the mineralogist. 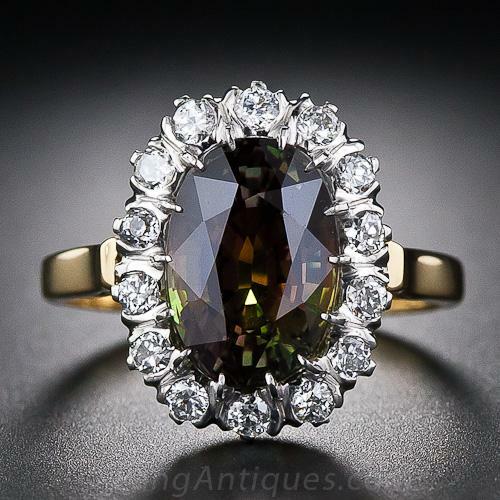 Alexandrite in gem form rarely weighs over one to three carats. It is characterized by pleochroism of a fine green changing to a bright raspberry red. In Ceylon larger gems have been found, occasionally weighing 60 carats each. This is rare. Usually the gems weigh one or two carats. The color of these alexandrites is darker green, and the change in incandescent is not as profound as the Russian stones. Red and green are the Russian national colors, making alexandrite a great favorite in Russia. It is looked upon as a stone of good omen and fortune in that country. Russian alexandrite has not been mined in decades. The majority of alexandrite available on the market today originated from Brazil, and occasionally India and Madagascar. Alexandrites from these localities exhibit an impressive color change from a bluish-green to a bright raspberry red. Alexandrite is the birthstone for June and the Anniversary Gem for the 45th and 55th year of marriage! Because of alexandrite's rarity, genuine stones are often substituted with a variety of synthetic sapphire that exhibits a slight color change from blue to purple. Alexandrite represents the astrological Sign Scorpio. Alexandrite is often associated with luck and prosperity. It is attributed with the ability to aid in problems with the nervous system, spleen, pancreas & testicles. Alexandrite has been attributed with several mystical properties, including reinforcing one's self esteem and balancing positive and negative energy.